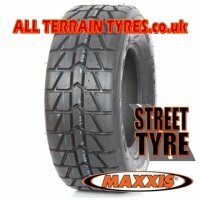 The Maxxis Streetmaxx and Goldspeed RL C9272 Front and C9273 Rear tyres are pure bred street quad tyres optimised for use as a matched set on public roads and tarmac. Predictable steering, grip and braking combine to give the rider an exhilerating but safe ride. Tyres are 'E' marked with a 140 km/h (88 mph) speed rating, and the sidewalls are marked "ATV for street use".